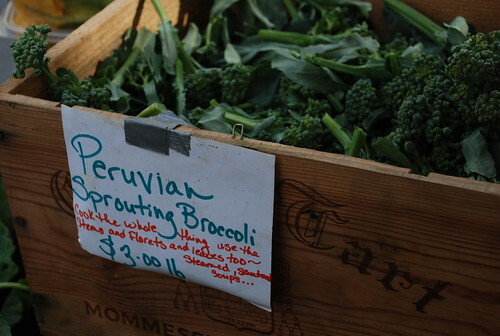 As we mentioned yesterday, GrowNYC is just beginning to hear about Irene-related damages from Greenmarket farmers throughout New Jersey, New York, Pennsylvania and Connecticut. Wind, water and flooding may not have affected us so much here in Manhattan, but they have taken their toll on many areas just outside of the city. Some of the incredible hard-to-find goods grown by Kira at Evolutionary Organics. Photo from Flickr.com. As we mentioned yesterday, GrowNYC is just beginning to hear about Irene-related damages from Greenmarket farmers throughout New Jersey, New York, Pennsylvania and Connecticut. Wind, water and flooding may not have affected us so much here in Manhattan, but they have taken their toll on many areas just outside of the city. One of our very favorite farmers — Kira Kinney, who runs Evolutionary Organics near New Paltz and comes to Thompkins Square Park on Sundays with her truly stellar varieties of baby greens, tomatoes, squash, cucumbers and chiles — has reported that she has 26 acres underwater. (Kinney, you may recall, already suffered through a barn fire last year.) The non-profit has set up a donation page where funds are being collected specifically to distribute to farmers with hurricane damage. Click here to help!